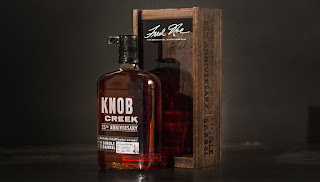 Twenty-Five years ago, when Booker Noe bottled the first batch of Knob Creek® bourbon, he inadvertently started a small batch movement. A quarter century later, Booker’s son Fred Noe carries on his legacy, holding every barrel to the same rigorous Pre-Prohibition style standards. And to this day, Knob Creek® remains the benchmark for full-flavored bourbon. To celebrate the staying power of hard-earned flavor, we’re bottling a limited edition, unfiltered* and cask strength single barrel bourbon. This bourbon is truly a high point in Knob Creek®’s proud history. This is our first ever bourbon bottled at barrel strength. Now you can experience the exceptional flavor profile of these personally selected barrels as if you were at the warehouse in Clermont: uncut and unblended.